Not to be confused with Asociality, Antisocial personality disorder, Social phobia, or Counterculture. Anti-social behaviours are actions that harm or lack consideration for the well-being of others. It has also been defined as any type of conduct that violates the basic rights of another person and any behaviour that is considered to be disruptive to others in society. This can be carried out in various ways, which includes but is not limited to intentional aggression, as well as covert and overt hostility. Anti-social behaviour also develops through social interaction within the family and community. It continuously affects a child's temperament, cognitive ability and their involvement with negative peers, dramatically affecting children's problem solving skills. Many people also label behaviour which is deemed contrary to prevailing norms for social conduct as anti-social behaviour. However, researchers have stated that it is a difficult term to define, particularly in the United Kingdom where there are an infinite number of acts that fall into its category. The term is especially used in British English. Although the term is fairly new to the common lexicon, the word anti-social behaviour has been used for many years in the psychosocial world where it was defined as “unwanted behaviour as the result of personality disorder." For example, David Farrington, a British criminologist and forensic psychologist, stated that teenagers can exhibit anti-social behaviour by engaging in various amounts of wrongdoings such as stealing, vandalism, sexual promiscuity, excessive smoking, heavy drinking, confrontations with parents, and gambling. Anti-social is frequently used, incorrectly, to mean either "nonsocial" or "unsociable". The words are not synonyms. Anti-social behaviour is typically associated with other behavioural and developmental issues such as hyperactivity, depression, learning disabilities and impulsivity. Alongside these issues one can be predisposed or more inclined to develop such behaviour due to one's genetics, neurobiological and environmental stressors in the prenatal stage of one's life, through the early childhood years. The American Psychiatric Association, in its Diagnostic and Statistical Manual of Mental Disorders, diagnoses persistent anti-social behaviour as antisocial personality disorder. Genetic factors include abnormalities in the prefrontal cortex of the brain while neurobiological risks include maternal drug use during pregnancy, birth complications, low birth weight, prenatal brain damage, traumatic head injury, and chronic illness. The World Health Organization includes it in the International Classification of Diseases as dissocial personality disorder. A pattern of persistent anti-social behaviours can also be present in children and adolescents diagnosed with conduct problems, including conduct disorder or oppositional defiant disorder under the DSM-5. It has been suggested that individuals with intellectual disabilities have higher tendencies to display anti-social behaviours, but this may be related to social deprivation and mental health problems. More research is required on this topic. Intent and discrimination may determine both pro- and anti-social behaviour. Infants may act in seemingly anti-social ways and yet be generally accepted as too young to know the difference before the age of 4 or 5. Berger states that parents should teach their children that "emotions need to be regulated, not depressed". Studies have shown that in children between ages 13–14 who bully or show aggressive behaviour towards others exhibit anti-social behaviours in their early adulthood. There are strong statistical relationships that show this significant association between childhood aggressiveness and anti-social behaviours. Analyses saw that 20% of these children who exhibit anti-social behaviours at later ages had court appearances and police contact as a result of their behaviour. Many of the studies regarding the media's influence on anti-social behaviour have been deemed inconclusive. Violence, racism, sexism, and other anti-social acts are attributed to things such as genetic predisposition and violence in the home. Some reviews have found strong correlations between aggression and the viewing of violent media, while others find little evidence to support their case. The only unanimously accepted truth regarding anti-social behaviour is that parental guidance carries an undoubtedly strong influence; providing children with brief negative evaluations of violent characters helps to reduce violent effects in the individual. Families greatly impact the causation of anti-social behaviour. Some other familial causes are parent history of anti-social behaviours, parental alcohol and drug abuse, unstable home life, absence of good parenting, physical abuse, parental instability (mental health issues/PTSD) and economic distress within the family. There is a small link between antisocial personality characteristics in adulthood and more TV watching as a child. The risk of early adulthood criminal conviction increased by nearly 30 percent with each hour children spent watching TV on an average weekend. Peers can also impact one's predisposition to anti-social behaviours, in particular, children in peer groups are more likely to associate with anti-social behaviours if present within their peer group. Especially within youth, patterns of lying, cheating and disruptive behaviours found in young children are early signs of anti-social behaviour. Adults must intervene if they notice their children providing these behaviours. Early detection is best in the preschool years and middle school years in best hopes of interrupting the trajectory of these negative patterns. These patterns in children can lead to conduct disorder, a disorder that allows children to rebel against atypical age-appropriate norms. Moreover, these offences can lead to oppositional defiant disorder, which allows children to be defiant against adults and create vindictive behaviours and patterns. Furthermore, children who exhibit anti-social behaviour also are more prone to alcoholism in adulthood. A recent genome-wide analysis of anti-social behaviour in a large combined sample has shown that a large number of genetic variants of low individual effect play a role in anti-social behaviour. Moreover, this study showed that several variants show gender-specific effects on anti-social behaviour in males and females.The study identified a specific gene which is one serotonin transporter gene variant is particularly associated with psychopathic trends in young people. As a high prevalence mental health problem in children, many interventions and treatments are developed to prevent anti-social behaviours and to help reinforce pro-social behaviours. Several factors are considered as direct or indirect causes of developing anti-social behaviour in children. Addressing these factors are necessary to develop a reliable and effective intervention or treatment. Children's perinatal risk, temperament, intelligence, nutrition level, and interaction with parents or caregivers can influence their behaviours. As for parents or caregivers, their personality traits, behaviours, socioeconomic status, social network, and living environment can also affect children's development of anti-social behaviour. An individual's age at intervention is a strong predictor of the effectiveness of a given treatment. The specific kinds of anti-social behaviours exhibited, as well as the magnitude of those behaviours also impact how effective a treatment is for an individual. Behavioural parent training (BPT) is more effective to preschool or elementary school-aged children, and cognitive behavioural therapy (CBT) has higher effectiveness for adolescents. Moreover, early intervention of anti-social behaviour is relatively more promising. For preschool children, family is the main consideration for the context of intervention and treatment. The interaction between children and parents or caregivers, parenting skills, social support, and socioeconomic status would be the factors. For school-aged children, the school context also needs to be considered. The collaboration amongst parents, teachers, and school psychologists are usually recommended to help children develop the ability of resolving conflicts, managing their anger, developing positive interactions with other students, and learning pro-social behaviours within both home and school settings. Moreover, the training for parents or caregivers are also important. Their children would be more likely to learn positive social behaviours and reduce inappropriate behaviours if they become good role models and have effective parenting skills. Cognitive behavioural therapy (CBT), is a highly effective, evidence-based therapy, in relation to anti-social behaviour. This type of treatment focuses on enabling the patients to create an accurate image of the self, allowing the individuals to find the trigger of their harmful actions and changing how individuals think and act in social situations. Due to their impulsivity, their inability to form trusting relationships and their nature of blaming others when a situation arises, individuals with particularly aggressive anti-social behaviours tend to have maladaptive social cognitions, including hostile attribution bias, which lead to negative behavioural outcomes. CBT has been found to be more effective for older children and less effective for younger children. Problem-solving skills training (PSST) is a type of CBT that aims to recognize and correct how an individual thinks and consequently behaves in social environments. This training provides steps to assist people in obtaining the skill to be able to evaluate potential solutions to problems occurring outside of therapy and learn how to create positive solutions to avoid physical aggression and resolve conflict. Therapists, when providing CBT intervention to individuals with anti-social behaviour, should first assess the level of the risk of the behaviour in order to establish a plan on the duration and intensity of the intervention. Moreover, therapists should support and motivate individuals to practice the new skills and behaviours in environments and contexts where the conflicts would naturally occur to observe the effects of CBT. Behavioural parent training (BPT) or parent management training (PMT), focuses on changing how parents interact with their children and equips them with ways to recognize and change their child's maladaptive behaviour in a variety of situations. BPT assumes that individuals are exposed to reinforcements and punishments daily and that anti-social behaviour, which can be learned, is a result of these reinforcements and punishments. Since certain types of interactions between parents and children may reinforce a child's anti-social behaviour, the aim of BPT is to teach the parent effective skills to better manage and communicate with their child. This could be done by reinforcing pro-social behaviours while punishing or ignoring anti-social behaviours. It is important to note that the effects of this therapy can be seen only if the newly acquired communication methods are maintained. BPT has been found to be most effective for younger children under the age of 12. Researchers credit the effectiveness of this treatment at younger ages due to the fact that younger children are more reliant on their parents. BPT is used to treat children with conduct problems, but also for children with ADHD. According to a meta-analysis, the effectiveness of BPT is supported by short-term changes on the children's anti-social behaviour. However, whether these changes are maintained over a longer period of time is still unclear. Psychotherapy or talk therapy, although not always effective, can also be used to treat individuals with anti-social behaviour. Individuals can learn skills such as anger and violence management. This type of therapy can help individuals with anti-social behaviour bridge the gap between their feelings and behaviours, which they lack the connection previously. It is most effective when specific issues are being discussed with individuals with anti-social behaviours, rather than a broad general concept. This type of therapy works well with individuals who are at a mild to moderate stage of anti-social behaviour since they still have some sense of responsibility regarding their own problems. When working with individuals with anti-social behaviour, therapist must be mindful of building a trusting therapeutic relationship since these individuals might have never experienced rewarding relationships. Therapists also need to be reminded that changes might take place slowly, thus an ability for noticing small changes and constant encouragement for individuals with anti-social behaviour to continue the intervention are required. Family therapy, which is a type of psychotherapy, helps promote communication between family members, thus resolving conflicts related to anti-social behaviour. Since family exerts enormous influence over children's development, it is important to identify the behaviours that could potentially lead to anti-social behaviours in children. It is a relatively short-term therapy which involves the family members who are willing to participate. Family therapy can be used to address specific topics such as aggression. The therapy may end when the family can resolve conflicts without needing the therapists to intervene. There is no official diagnosis for anti-social behaviour. However, we can have a look at the official diagnosis for Antisocial Personality Disorder (ASPD) and use it as guideline while keeping in mind that anti-social behaviour and ASPD are not to be confused. When looking at non-ASPD patients (who show anti-social behaviour) and ASPD patients, it all comes down to the same types of behaviours. However, ASPD is a Personality Disorder which is defined by the consistency and stability of the observed behaviour, in this case, anti-social behaviour. Antisocial Personality Disorder can only be diagnosed when a pattern of anti-social behaviour began being noticeable during childhood and/or early teens and remained stable and consistent across time and context. In the official DSM IV-TR for ASPD, it is specified that the anti-social behaviour has to occur outside of time frames surrounding traumatic life events or manic episodes (if the individual is diagnosed with another mental disorder). The diagnosis for ASPD cannot be done before the age of 18. For example, someone who exhibits anti-social behaviour with their family but pro-social behaviour with friends and coworkers would not qualify for ASPD because the behaviour is not consistent across context. Someone who was consistently behaving in a pro-social way and then begins exhibiting anti-social behaviour in response to a specific life event would not qualify for ASPD either because the behaviour is not stable across time. Law breaking behaviour in which the individuals are putting themselves or others at risk is considered anti-social even if it is not consistent or stable (Examples : speeding, use of drugs, getting in physical conflict). In relation to the previous statement, juvenile delinquency is a core element to the diagnosis of ASPD. Individuals who begin getting in trouble with the law (in more than one area) at an abnormally early age (around 15) and keep recurrently doing so in adulthood may be suspected of having ASPD. With some limitations, research has established a correlation between frustration and aggression when it comes to anti-social behaviour. The presence of anti-social behaviour may be detected when an individual is experiencing an abnormally high amount of frustrations in their daily life routine and when those frustrations always result into aggression. The term impulsivity is commonly used to describe this behavioural pattern. Anti-social behaviour can also be detected if the aggressiveness and impulsiveness of the individual's behaviour in response to frustrations is so that it causes obstruction to social interactions and achievement of personal goals. In both of these cases, we can consider the different types of treatment and therapy previously mentioned in this article. Examples in childhood: unable to make friends, unable to follow rules, getting kicked out of school, unable to fulfill minimal levels of education (elementary school, middle school). Examples in early adulthood: unable to keep a job or an apartment, difficulty to maintain relationships. The prognosis of having anti-social behaviour is not very favourable due to its high stability throughout children development. Studies have shown that children who are aggressive and have conduct problems are more likely to have anti-social behaviour in adolescence. Early intervention of anti-social behaviour is relatively more effective since the anti-social pattern lasts for a shorter period of time. Moreover, since younger children would have smaller social networks and less social activities, fewer contexts need to be considered for the intervention and treatment. For adolescents, studies have shown that the influence of treatments becomes less effective. The prognosis seems to not be influenced by the duration of intervention, however; a long-term follow-up is necessary to confirm that the intervention or treatment is effective. Individuals who exhibit anti-social behaviour are more likely to use drugs and abuse alcohol. This could make the prognosis worse since he or she would less likely be involved in social activities and would become more isolated. An anti-social behaviour order (ASBO) is a civil order made against a person who has been shown, on the balance of evidence, to have engaged in anti-social behaviour. The orders, introduced in the United Kingdom by Prime Minister Tony Blair in 1998, were designed to criminalize minor incidents that would not have warranted prosecution before. The Crime and Disorder Act 1998 defines anti-social behaviour as acting in a manner that has "caused or was likely to cause harassment, alarm or distress to one or more persons not of the same household" as the perpetrator. There has been debate concerning the vagueness of this definition. 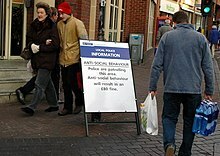 In a survey conducted by University College London during May 2006, the UK was thought by respondents to be Europe's worst country for anti-social behaviour, with 76% believing Britain had a "big or moderate problem". Current legislation governing anti-social behaviour in the UK is the Anti-Social Behaviour, Crime and Policing Act 2014 which received Royal Assent in March 2014 and came into enforcement in October 2014. This replaces tools such as the ASBO with 6 streamlined tools designed to make it easier to act on anti-social behaviour. Anti-social behaviour can have a negative effect and impact on Australian communities and their perception of safety. The Western Australia Police force define anti-social behaviour as any behaviour that annoys, irritates, disturbs or interferes with a persons’ ability to go about their lawful business. In Australia, many different acts are classed as anti-social behaviour such as, misuse of public space, disregard for community safety, disregard for personal well-being, acts directed at people, graffiti, protests, liquor offences and drunk driving. It has been found that it is very common for Australian adolescents to engage in different levels of anti-social behaviour. A survey was conducted in 1996 in New South Wales, Australia, of 441, 234 secondary school students in years 7 to 12 about their involvement in anti-social activities. 38.6% reported intentionally damaging or destroying someone else's property, 22.8% admitted to having received or selling stolen goods and close to 40% confessed to attacking someone with the idea of hurting them. The Australian community are encouraged to report any behaviour of concern and play a vital role assisting police in reducing anti-social behaviour. One study conducted in 2016 established how perpetrators of anti-social behaviour may not actually intend to cause offense. The study examined anti-social behaviours (or microaggressions) within the LGBTIQ community on a university campus. The study established how many members felt that other people would often commit anti-social behaviours, however there was no explicit suggestion of any maliciousness behind these acts. Rather, it was just that the offenders were naive to the impact of their behaviour. The Western Australia Police force uses a three-step strategy to deal with anti-social behaviour. Prevention – This action uses community engagement, intelligence, training and development and the targeting of hotspots, attempting to prevent unacceptable behaviour from occurring. Response – A timely and effective response to anti-social behaviour is vital. Police provide ownership, leadership and coordination to apprehend offenders. Resolution – Identifying the underlying issues that cause anti-social behaviour and resolve these issues with the help of the community. Offenders are successfully prosecuted. ^ a b c Berger KS (2003). The Developing Person Through Childhood and Adolescence (6th ed.). Worth Publishers. ISBN 978-0-7167-5257-8. ^ Calkins SD, Keane SP (2009). "Developmental origins of early antisocial behavior". Development and Psychopathology. 21 (4): 1095–109. doi:10.1017/S095457940999006X. PMC 2782636. PMID 19825259. ^ a b "Antisocial behavior facts, information, pictures | Encyclopedia.com articles about Antisocial behavior". www.encyclopedia.com. Archived from the original on 25 March 2018. Retrieved 29 March 2018. ^ a b c d "Antisocial Behavior". Gale Encyclopedia of Children's Health: Infancy through Adolescence. Thomson Gale. 2006. Archived from the original on 25 March 2018. Retrieved 22 March 2018. ^ Anti Social Behaviour Team (2014). "Anti Social Behaviour". Breckland.gov.uk. Archived from the original on 18 October 2014. Retrieved 29 April 2014. ^ a b c d Millie, Andrew (1 December 2008). Anti-Social Behaviour. McGraw-Hill Education (UK). ISBN 9780335237623. Archived from the original on 30 March 2018. ^ "Antisocial". Oxford Dictionaries. Archived from the original on 25 September 2016. Retrieved 2 October 2016. ^ "Asocial". brians.wsu.edu. Washington State University. Archived from the original on 28 March 2018. Retrieved 28 March 2018. ^ "Antisocial Personality Disorder". BehaveNet. Archived from the original on 11 February 2012. Retrieved 1 May 2013. ^ "International Statistical Classification of Diseases and Related Health Problems 10th Revision". Archived from the original on 17 July 2009. ^ a b c d e McCart MR, Priester PE, Davies WH, Azen R (August 2006). "Differential effectiveness of behavioral parent-training and cognitive-behavioral therapy for antisocial youth: a meta-analysis". Journal of Abnormal Child Psychology. 34 (4): 527–43. doi:10.1007/s10802-006-9031-1. PMID 16838122. ^ Dickson K, Emerson E, Hatton C (November 2005). "Self-reported anti-social behaviour: prevalence and risk factors amongst adolescents with and without intellectual disability". Journal of Intellectual Disability Research. 49 (Pt 11): 820–6. doi:10.1111/j.1365-2788.2005.00727.x. PMID 16207279. ^ a b c Renda J, Vassallo S, Edwards B (April 2011). "Bullying in early adolescence and its association with anti-social behaviour, criminality and violence 6 and 10 years later". Criminal Behaviour and Mental Health. 21 (2): 117–27. doi:10.1002/cbm.805. PMID 21370297. ^ a b Nathanson AI (June 2004). "Factual and Evaluative Approaches to Modifying Children's Responses to Violent Television". Journal of Communication. 54 (2): 321–336. doi:10.1111/j.1460-2466.2004.tb02631.x. ^ Anderson CA, Gentile DA, Buckley KE (15 December 2006). Violent Video Game Effects on Children and Adolescents: Theory, Research, and Public Policy: Theory, Research, and Public Policy. Oxford University Press. ISBN 978-0-19-534556-8. Retrieved 24 November 2014. ^ Sherry JL (2007). Preiss RW, Gayle BM, Burrell N, Allen M, Bryant J (eds.). Mass Media Effects Research: Advances Through Meta-analysis. Lawrence Erlbaum Associates. pp. 245–262. ISBN 978-0-8058-4998-1. Retrieved 24 November 2014. ^ a b c d e "Taylor & Francis Group". www.taylorfrancis.com. Archived from the original on 28 March 2018. Retrieved 27 March 2018. ^ a b c "Antisocial behavior facts, information, pictures". www.encyclopedia.com. Archived from the original on 25 March 2018. Retrieved 27 March 2018. ^ read, Rick Nauert PhD Last updated: 8 Aug 2018 ~ 2 min (19 February 2013). "Can Too Much TV in Childhood Cause Adult Antisocial Behavior?". psychcentral.com. Retrieved 9 January 2019. ^ Tielbeek, Jorim J.; Johansson, Ada; Polderman, Tinca J. C.; Rautiainen, Marja-Riitta; Jansen, Philip; Taylor, Michelle; Tong, Xiaoran; Lu, Qing; Burt, Alexandra S. (1 December 2017). "Genome-Wide Association Studies of a Broad Spectrum of Antisocial Behavior". JAMA Psychiatry. 74 (12): 1242–1250. doi:10.1001/jamapsychiatry.2017.3069. ISSN 2168-622X. PMC 6309228. PMID 28979981. ^ read, Rick Nauert PhD Last updated: 8 Aug 2018 ~ 2 min (6 August 2010). "Antisocial Behavior Linked to Genes and Environment". psychcentral.com. Retrieved 9 January 2019. ^ a b c d e f g Braet C, Meerschaert T, Merlevede E, Bosmans G, Leeuwen KV, De Mey W (2009). "Prevention of antisocial behaviour: Evaluation of an early intervention programme". European Journal of Developmental Psychology. 6 (2): 223–240. doi:10.1080/17405620601033194. ^ Reyno SM, McGrath PJ (January 2006). "Predictors of parent training efficacy for child externalizing behavior problems--a meta-analytic review". Journal of Child Psychology and Psychiatry, and Allied Disciplines. 47 (1): 99–111. doi:10.1111/j.1469-7610.2005.01544.x. PMID 16405646. ^ a b c d e Mash EJ, Wolfe DA (2016). Abnormal Child Psychology. Belmont, CA: Wadsworth Publishing Company. p. 269. ISBN 978-1-305-10542-3. ^ a b "Antisocial Behavior - Causes and characteristics, Treatment". psychology.jrank.org. Archived from the original on 4 May 2016. Retrieved 22 March 2018. ^ "Cognitive-Behavioral Therapy for Personality Disorders (CBT)". www.mentalhelp.net. Archived from the original on 18 March 2016. Retrieved 13 May 2016. ^ a b Armelius BA, Andreassen TH (October 2007). "Cognitive-behavioral treatment for antisocial behavior in youth in residential treatment". The Cochrane Database of Systematic Reviews (4): CD005650. doi:10.1002/14651858.CD005650.pub2. PMID 17943869. ^ a b Black D (2016). "Treatment for Antisocial Personality Disorder". Psych Central. Archived from the original on 21 March 2018. Retrieved 28 February 2018. ^ Bennett DS, Gibbons TA (2000). "Efficacy of Child Cognitive-Behavioral Interventions for Antisocial Behavior: A Meta-Analysis". Child & Family Behavior Therapy. 22 (1): 1–15. doi:10.1300/J019v22n01_01. ^ Kazdin AE (2009). "Problem Solving Skills Training". California Evidence-Based Clearinghouse for Child Welfare. Archived from the original on 1 May 2016. Retrieved 13 May 2016. ^ a b c d e Serketich WJ, Dumas JE (1996). "The effectiveness of behavioral parent training to modify antisocial behavior in children: A meta-analysis". Behavior Therapy. 27 (2): 171–186. doi:10.1016/s0005-7894(96)80013-x. ^ McCart MR, Priester PE, Davies WH, Azen R (August 2006). "Differential effectiveness of behavioral parent-training and cognitive-behavioral therapy for antisocial youth: a meta-analysis". Journal of Abnormal Child Psychology. 34 (4): 527–43. doi:10.1007/s10802-006-9031-1. PMID 16838122. ^ a b Mayo Clinic (2018). "Antisocial personality disorder - Diagnosis and treatment". Archived from the original on 11 December 2017. Retrieved 24 February 2018. ^ a b "How to Treat Antisocial Personality Disorder". The Ranch. 2017. Archived from the original on 27 March 2018. Retrieved 22 March 2018. ^ a b Bressert, Steve (2017). "Antisocial Personality Disorder Treatment". Psych Central. Archived from the original on 17 March 2018. Retrieved 22 March 2018. ^ a b Mayo Clinic. "Family therapy". www.mayoclinic.org. Archived from the original on 21 December 2017. Retrieved 27 March 2018. ^ Development Services Group, Inc. 2014 (2014). "Family Therapy" (PDF). Office of Juvenile Justice and Delinquency Prevention. Archived (PDF) from the original on 28 March 2018. ^ Tolan, PH, Mitchell, ME (January 2009). "Families and the Therapy of Antisocial and Delinquent Behavior". Journal of Psychotherapy & the Family. 6 (3–4): 29–48. doi:10.1300/J287v06n03_03. ^ a b Bergen S, Krane J (2009). Antisocial personality disorder: an exploration and discussion of the experience, impact and opinions of the diagnosed individual (Thesis). Montreal: McGill University. p. 8. Archived from the original on 25 March 2018. ^ a b "Diagnostic criteria for 301.7 Antisocial Personality Disorder". Behave.net. 2018. Archived from the original on 28 November 2017 – via American Psychiatric Association. ^ a b Clarke D (July 2003). Pro-Social and Anti-Social Behaviour. London: Routledge. p. 79. ISBN 978-1-134-58755-1. OCLC 56615122. ^ Coie JD, Dodge KA (1998). "Aggression and antisocial behavior". In Damon W, Eisenberg N (eds.). Handbook of child psychology. 3 Social, emotional, and personality development (5th ed.). New York: Wiley. pp. 779–863. ^ Loeber R, Dishion T (July 1983). "Early predictors of male delinquency: a review". Psychological Bulletin. 94 (1): 68–99. doi:10.1037/0033-2909.94.1.68. PMID 6353467. ^ Kazdin AE (1987). "Conduct disorders in childhood and adolescence". Newbury Park, CA: Sage. ^ Kazdin AE (February 1997). "Practitioner review: psychosocial treatments for conduct disorder in children". Journal of Child Psychology and Psychiatry, and Allied Disciplines. 38 (2): 161–78. CiteSeerX 10.1.1.471.1997. doi:10.1111/j.1469-7610.1997.tb01851.x. PMID 9232463. ^ Robins LN (August 1998). "The intimate connection between antisocial personality and substance abuse". Social Psychiatry and Psychiatric Epidemiology. 33 (8): 393–9. doi:10.1007/s001270050071. PMID 9708027. ^ "Antisocial Behavior and Drug Addiction: Dual Diagnosis". Dual Diagnosis. Archived from the original on 25 March 2018. Retrieved 22 March 2018. ^ "ASBOs can't beat a neighborhood policeman". Timesonline.co.uk. 30 September 2009. Retrieved 29 April 2014. ^ "BBC Q&A Anti-social behaviour orders". BBC News. 20 March 2002. Archived from the original on 26 October 2014. Retrieved 29 April 2014. ^ Weaver M (9 May 2006). "UK 'has worst behaviour problem in Europe". The Guardian. ^ "What the Law Says". ASB Help. Archived from the original on 29 November 2014. Retrieved 26 September 2014. ^ Morgan A, McAtamney A (2009). "Key Issues in Antisocial Behaviour" (PDF). Research in Practice. 5: 1. ISSN 1836-9111. ^ "Anti-social behaviour". Crime Stoppers Western Australia. Archived from the original on 13 May 2016. Retrieved 13 May 2016. ^ "Patterns and precursors of adolescent antisocial behaviour". Australian Institute of Family Studies. 2002. Archived from the original on 17 June 2016. Retrieved 13 May 2016. ^ Roffee JA, Waling AM (2016). "Rethinking microaggressions and anti-social behaviour against LGBTIQ+ Youth". Safer Communities. 15 (4): 190–201. doi:10.1108/SC-02-2016-0004. ^ Western Australia Police (2009). "Anti-social behaviour Strategy 2009-2011" (PDF). Frontline First. pp. 3–4. Archived (PDF) from the original on 14 May 2016. Yang Y, Glenn AL, Raine A (2008). "Brain abnormalities in antisocial individuals: implications for the law". Behavioral Sciences & the Law. 26 (1): 65–83. CiteSeerX 10.1.1.210.622. doi:10.1002/bsl.788. PMID 18327831.